A slice of Rome in Clerkenwell. Lawrence:King worked closely with our clients within a tight budget and timescale to design and construct this flagship fit out for a new chain of Italian style pizza bars for Malletti. Completed in spring 2008, it provides a casual and friendly dining experience conceived as a simple, contemporary reinterpretation of the traditional Italian pizza bars found in Rome. The property is located within a conservation area and the existing Victorian shopfront has therefore been retained and faithfully restored, while incorporating new awnings and signage. The servery counter forms the focus of the ground floor that also incorporates a small area of built-in bench seating along the shopfront window and adjacent accessible wc. The pizza preparation area is located to the rear. An open plan stair leads down to a small dining area in the basement that also accomodates the main kitchen, toilets, office and staff facilities. 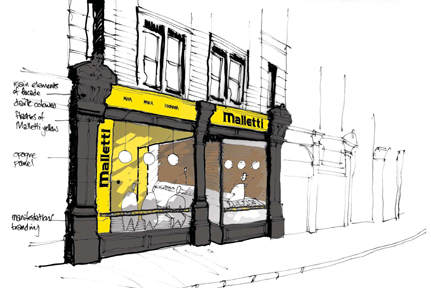 Existing found natural finishes such of the hardwood parquet floor and exposed brick wall have been retained in contract to the crisp yellow and grey walls of the Malletti brand colour scheme. A future roll out of the concept is planned for a number of strategic locations across London including initial outlets planned for sites in Soho, Clerkenwell and Farringdon.